The Celestial Teapot is frequently understood as an analogy for belief in a god or gods. This is to do Bertrand Russell an injustice. His attack was much wider than that. Russell opposed all dogmatic beliefs, classifying any system of thought that used strongly held beliefs to justify the silencing of opposing voices as religion. If you accept Russell’s definition of religion then the Northern Ireland conflict is, as Richard Dawkins alleges, although not in the way he means; a religious conflict, with two similar but opposing dogmas. The Nationalist / Republican dogma – Ireland is one nation. These strongly held differences of opinion are heavily implicated in the recurring cycles of violence that afflict my native land. They themselves do not provide a sufficient cause for the violence, in that they are also held in the periods of peace interspersing the violence. I think Richard Dawkins, in the following passage, provides an insight into the driving force that ties difference of opinion to persecution and violence. American polls suggest that atheists and agnostics far outnumber Jews, and even outnumber most other particular religious groups. Unlike Jews, however, who are notoriously one of the most effective political lobbies in the United States, and unlike evangelical Christians, who wield even greater political power, atheists and agnostics are not organized and therefore exert almost zero influence. Indeed organizing atheists has been compared to herding cats, because they tend to think independently and will not conform to authority. Dogma acts as a human herding tool. Those who direct the herd acquire a great deal of power. This they can maintain by direct persecution of opposing voices within the herd. Or they can persuade the herd that they are under threat from malignant forces and the herd will do the work for them. Our way of life is under attack by fundamentalist Teabaggians. They have disrespected the Teapot of Rationality; revealed to us first through the wisdom of the Ancient Philosopher. They will smash our china teapots and force us to embrace their vile custom of teabag dunking. We must stand together, and support the chosen ones, in opposing this evil tyranny. A real example of this kind of call can be found at the CAIN website, an archive of materials related to conflict in Northern Ireland. 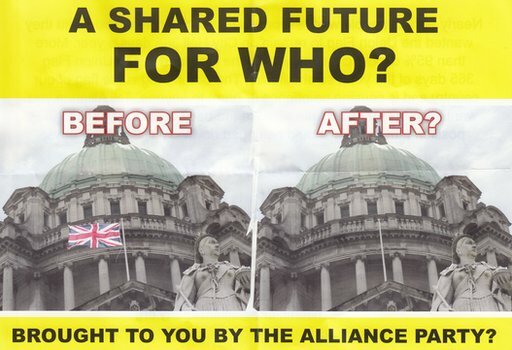 This leaflet was distributed throughout loyalist (working class unionist) areas of east Belfast, by the two main Unionist parties when, because they had lost their majority in Belfast City Council, they were unable to ensure that the symbolic representation of their dogma, the Union Flag remained flying constantly above City Hall, by normal political methods. Given the nature of this call, the distinct whiff of, “They’re coming to take us away!” and your culture is being disrespected; it should be no surprise that the people who were targeted by the propaganda were enflamed. 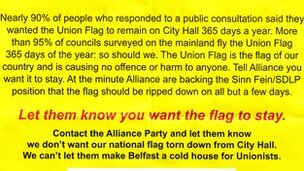 Nor that when the vote was taken and the Alliance Party, a group not aligned to either of the main political dogmas, and the holders of the balance of power, stuck to their party policy that the union flag should only fly on designated days, that riots ensued. 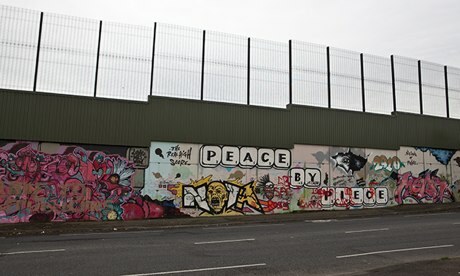 Bertrand Russell’s definition of religion as any thought system that holds dogmatic opinions, and seeks to impose them, by force if necessary, means that the Northern Ireland conflict was and is by definition a religious conflict. This definition is misleading. Dogmatism is related to power politics, and it is therefore primarily, even if it is a traditionally religious dogma that is being enforced, a political position. And in my country in recent times it has been political dogmatists, with in many cases the full support of religious dogmatists, that have undermined the peace. Encouraging members of our different political and religious communities, to identify those with differing views as Those Evil Awful People Over There. T.E.A.P.O.T. It is this teapotting of the other that can turn ordinary decent individuals into angry and cohesive herds of people, ripe for milking by power seekers. Michael Ruse, professor of philosophy at Florida State University, in an article discussing how Richard Dawkins’ Humanism is unlike his own humanism, in that it has ended up acting like a religion, made the following claim. ….. rival religions tend to say awful things about each other, putting down the doctrines and the practitioners. Think of evangelicals on the subject of Mitt Romney’s Mormonism, or of Northern Irish Protestants on the subject of the Pope. In reality, what a Northern Ireland Protestant will tell you about the Pope, depends on which of us you ask. Some within our community for instance think that the present pope, Pope Francis, is a really decent bloke; and are therefore inclined to wonder how long before the Vatican gets round to assassinating him. There is a tendency for people, including Northern Irish people, to regard the Protestant paranoia over Catholic intentions, found within my community, as primal. This is not so. The teapotting behaviour of the authorities was deliberate and rational. They were ensuring that Ulster Protestants were too afraid to rise against them, and would support the authorities against their Catholic neighbours. That is the authorities were aware of what they were doing. Not all of those who use teapotting to label others, as those evil awful people over there, are this self- aware. Michael Ruse is a case in point. In his article, Curb Your Enthusiasm, he notes similarities in the behaviour of Richard Dawkins and the New Atheists, with the “squabbles” of the Reformation. In the caricaturing of ‘faith’ as murderous fundamentalism, one hears echoes of the bloody and interminable Reformation squabbles between Protestants and Catholics. One also sees contempt for fellow human beings, many of whom are educated, thinking members of society. It turns out however that Professor Ruse’s objection isn’t in the teapotting of other people as inherently contemptible. It is that they have teapotted the wrong people, decent human beings like himself, “many of whom are educated, thinking members of society.” The professor thinks that they should be showing contempt for a different group of people. It is also, of course, to help the real enemy, those who turn their backs fully on science as they follow their religion. Instead of making allies of those believers who hate intolerance as much as do you, everyone is at war and no proper defence is mounted against the really dangerous, the genuinely fanatical and fundamentalist. Because of course, the fanaticism that Michael Ruse has noted in what he refers to as Humanists or New Atheists cannot be real fanaticism, because they are like him; non-religious, science- respecting, educated, thinking members of society. And as everyone knows the evil lies only in the other. The very prescient Jonathan Swift in a satirical essay arguing, at the time unnecessarily, against the abolition of Christianity; identified what I am calling teapotting, as factionalism, and argued that it was a consequence, not of religious belief but of human nature, i.e. instinctive. And that therefore abolishing Christianity, would not be sufficient to rid the world of factions. Are party and faction rooted in men’s hearts no deeper than phrases borrowed from religion, or founded upon no firmer principles? And is our language so poor that we cannot find other terms to express them? Are _envy, pride, avarice_ and_ambition_ such ill nomenclators, that they cannot furnish appellations for their owners? Will not_heydukes_ and _mamalukes, mandarins_ and patshaws_, or any other words formed at pleasure, serve to distinguish those who are in the ministry* from others who would be in it if they could? …………………. And therefore I think, there is little force in this objection against Christianity, or prospect of so great an advantage as is proposed in the abolishing of it. N.B. The ministry* referred to above is government ministry, not religious ministry, and Jonathan Swift is making a direct link between power seeking and factionalism. Jonathan Swift wrote this essay, more than one hundred years before the birth of Charles Darwin, and longer still before the birth of the father of genetics Gregor Mendel, and therefore was not in a position to speculate about the forces that created this drive for factionalism – the teapotic instinct. He certainly never had the opportunity to read Richard Dawkins’ book – The Selfish Gene. And it is the central idea in this book, gene selection, that can explain the teapotic drive. Factionalism creates small ponds in which big fish can have a disproportionate amount of influence. Making people afraid means that they are easier to control. Using direct coercion means that the would be big fish, would have to be genuinely more powerful, than those they set out to coerce. Creating paranoia within the pond about Those Evil Awful People Over There, those not in our faction, does not require the same degree of power from the would be leaders. It also creates conditions favourable for paranoia in the labelled people, making them vulnerable to Teapotters within their community. If there is a genetic component to the behaviour of the Teapotters, and if acquiring power increased in times past, their relative reproductive fitness, then the teapotic gene would have increased in the gene pool. This is so even if, as doesn’t seem unlikely, the overall genetic fitness of everyone in afflicted communities was lowered. That so many of those displaying teapotic behaviour, seem to be totally without self-awareness, believing that what they are claiming is empirical truth; is consistent with it being the result of what Richard Dawkins has referred to as the Selfish Gene. Instinct geared not to the good of the organism displaying the behaviour, but to promoting the behaviour that enabled the gene to become predominate in the gene pool in the first place.